Ok, time for some honesty. The last couple of months have been busy, to say the least. Exhausting and stressful. I normally manage stress very well, but I’m not sure what happened, I sort of lost my balance a little. And my fiance noticed. I don’t blame him. I was sighing uncontrollably (a sign that my adrenals are overworked). Acting a little odd (quiet instead of my usual bright self) and a little distracted. I was doing alot of my usual self-care rituals which were slowly working, but I just knew I needed to get through a particular period before I could see the light of a stress-free day. And get there I did. 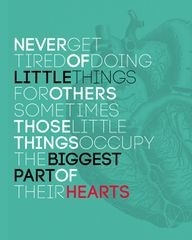 But not without the nudge of a random act of kindess. One day after I finished a beautiful yoga practice, I was driving to my favourite cafe spot to blog and drink some chai. (Doesn’t sound like I had much to stress about, huh?!) I received a text message from my fiance asking to me to look inside my yoga bag. I parked the car, and did just that. What I found had my literally blubbing away like a little kid in the middle of a busy street. In my hand I held a hand-written letter on a piece of torn envelope. Chris had reached out to me. Noticing my state of being, he decided to randomly send some love and kindness my way. He probably doesn’t realise that his letter was the catalyst for a massive shift for me. Those tears held relief, those words encouraged me to let go. That moment was exactly what I needed. What he did was philanthropic. He cared for me, nourished my soul and then enhanced my state of being. And simply by putting pen to paper, ok… envelope. But it got me thinking. When was the last time I did something, for someone, just because? Not to reap a reward or praise, but to simply just say “hello, I see you”. Back in the day when I used to work in PR a delightful colleague and I would head out for lunch. It was her idea, but we would shout out positive messages to random strangers in the street. It was silly and fun and possibly very immature. But mostly exciting to watch their faces. Of course, the messages we would shout out would be a little off-centre… “I like your freckles!” or “Your walk is hot!” or “Your nose suits your face!” Random. Yes. Kind. Yes. Or the time when my flatmate and friend helped Colin, a little old man who used to spend 1 hour every week shuffling down to the bins after bin day and return not only his bins, but every one on the block, back to their home. He was very old and slow, but we saw him do it every single week. One day, we decided to help him. I don’t think he knew what hit him. It can be something small – say hello to someone in the lift, smile at them and wish them a lovely day. Or leave a positive note pinned up in your building lobby. 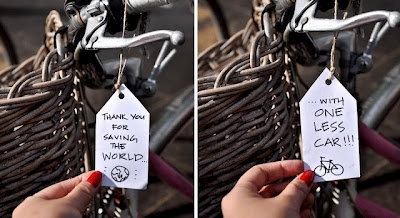 Tie a note to someone’s bike saying thanks for saving the world. Leave a love letter for you partner, or show up at a friend’s house, unannounced with a freshly baked cake. Or better still, leave the cake anonymously at your neighbours house. Whatever it is, I’m sure there is even one small way, each week, where we can dedicate our time to something other than ourselves. You would be surprised by the impact that one random act of kindness can have on an individual and their life. And, kindness is like a boomerang, it will come back to you. Wishing you the space to be open, kind and loving to everyone you cross paths with.